Includes: Guests staying at Nouvata receive 15% discount off full buffet lunch and dinner (excluding beverages). The discount will be deducted automatically from the room bill. Does not apply to breakfast in the restaurant, or drinks, tapas or snacks at Code Bar. NOTE: Resort Fee XPF250 & Eco Fee (Green Programme) XPF90 per room per night is payable direct. Includes: 1 free drink voucher per person (beer, wine or soft drink). Bonus: Save up to 30% on accommodation PLUS Duck Island return transfer for 2 adults, FREE Wi-Fi up to 250MB per room per day and FREE Gym access. 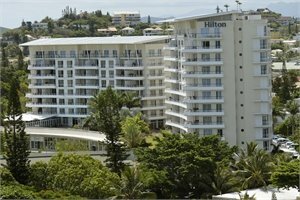 Includes: Includes a 15% discount on food consumed at La Terrasse Restaurant at Hilton Noumea La Promenade Residences (excludes breakfast, beverages, room service and bar only) and charged to the guest's room bill. 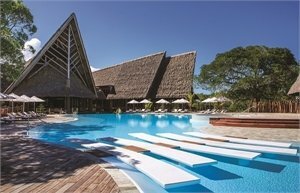 A unique blend of traditional French-European sophistication and Pacific island ambience. Located on the beachfront and overlooking Anse Vata bay. Tastefully appointed accommodation is complemented by a fine selection of International, Asian and French-European cuisine. 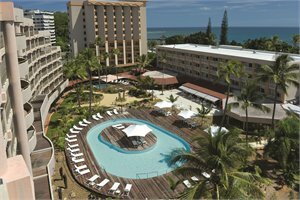 Includes: Free access to Tjibaou Center, complimentary access to Fitness Centre, unlimited use of non-motorised water sports equipment (upon availability), free entrance to the Grand Casino de Nouméa including XPF500 worth of gambling chips and 1 welcome drink per person. Bonus: Save up to 25% on accommodation. lots of land and water activities. Includes: Buffet breakfast daily, complimentary unlimited use of non-motorised water sports equipment (upon availability), access to the fitness centre (24/7) and use of bicycles (subject to availability), and complimentary Kids Club for children aged 1-12 years. Bonus: Includes 1 FREE night PLUS save up to 25% on accommodation. Located on an islet 20 minutes by boat from Noumea but a world away from the bustle of city life, this small and intimate island promises a relaxing and peaceful getaway. Built in perfect harmony with the environment, the 69 luxury Bungalows offer the highest level of comfort. 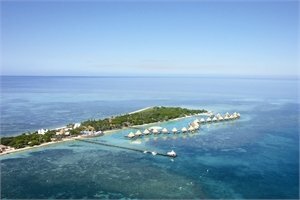 Includes: FREE return boat transfers from Port Moselle Pier to Escape Island Resort. Guests staying at Nouvata receive 15% discount off full buffet lunch and dinner (excluding beverages). The discount will be deducted automatically from the room bill. Does not apply to breakfast in the restaurant, or drinks, tapas or snacks at Code Bar. Bonus: At Escapade Island receive a discounted buffet dinner rate served at the hotel restaurant (excludes themed, Christmas and New Year's eve dinners). One person pays full price (direct to resort) and second person pays 50%.. Does not apply to beverages. PACKAGE TERMS & CONDITIONS: It is our policy to present the cost of our holidays inclusive of all airport and government charges. Please accept however that these charges are not within our control, therefore we reserve the right to pass on any increase.. Travel agent professional service fees where charged, will be additional to the advertised prices. Closeout and blackout periods apply over school holidays and peak holiday periods & availability of seats & rooms is likely to be very limited over this time . Valid for sales to 26 Apr 2019. Valid for travel commenced and completed within the period 1 May 2019 to 11 Dec 2019 (unless otherwise specified).Prices are ex Auckland. Payment and ticketing must be completed 72 hours after reservations are made or at least 3 days before departure. Book SB 'W' class ex Auckland - For travel: 1-31 May 19 use Fare Basis: WPROM1NZ ex AKL Book SB 'W' class ex Auckland - For travel: 3-28 Jun 19 use Fare Basis: WPROM2NZ ex AKL Book SB 'C' class ex Auckland - For travel: 1-31 Aug 19 use Fare Basis: CPROM1NZ ex AKL Book SB 'C' class ex Auckland - For travel: 19-31 Jul, 1-25 Sep, 18-27 Oct & 29 Oct - 11 Dec 19 use Fare Basis: CPROM2NZ ex AKL Prices shown are based on per person costs in New Zealand Dollars, for payment by cash, cheque or eftpos only. Credit card sales not permitted unless Travel Agent acts as a merchant. Capacity limitations apply and may not be available on all services. Travel requiring an overnight stay in New Zealand will be at passengers own expense. Events beyond our control such as currency fluctuations and changes to the price of aviation fuel may result in prices variations . Strict cancellation fees apply. Packages are based on consecutive nights. For split stays please contact your travel consultant. For full terms and conditions and cancellation fees please contact your local travel agent for more information. Trade enquiries via GO Holidays. ISSUE DATE: 9 APR 19 .